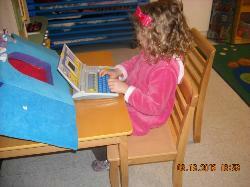 A good preschool experience is key to academic success in elementary school. It is at this time that children acquire an academic foundation in reading and math, develop logic, imagination, and self-esteem, and discover an excitement for learning. Through positive and challenging learning experiences at this early age, children will develop attitudes and traits which will prepare them to succeed in a competitive world. Circle Time – Concentrating on language, calendar, and math concepts, circle time also includes stories, nursery rhymes, poems, finger plays, storytelling, group games, and songs which introduce the children to the joys of language and literature. Letters – Children learn letters and letter sounds and are taught pre-reading skills through a variety of motivating activities. 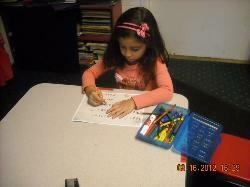 Those who are ready progress into a reading program tailored for the young child. Numbers – The children are introduced to beginning number concepts such as patterns, classification, matching, geometrical shapes and sizes, measurement, counting, numbers, simple addition and subtraction, time, and money. Science – Observations, experiments, nature walks, and discovery activities encourage the children to explore the world through their five senses. They learn about human, animal, and plant characteristics, needs, and development; about the physical elements of water, air, and earth; and about the qualities of the seasons. Social Studies – Children learn basic concepts of time and space by talking about maps, environments, and about children in other places and times. Art – Creative observation and expression are encouraged through the use of varied media such as paint, crayons, chalk, clay, scissors, glue, and more. 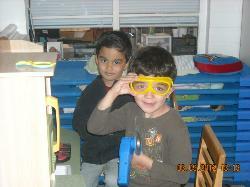 Music – Rhythm, song, and dance activities foster the children’s musical appreciation and skills. Children acquire a joy of singing and of feeling rhythm while learning imaginative, uplifting songs. Movement – A combination of creative movement games and gross motor activities help develop the children’s coordination and awareness of the body. 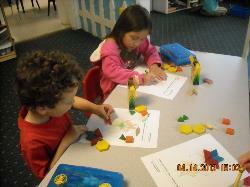 They learn to “work” together in a group setting, as well as to move creatively and expressively. Dramatic and Creative Play – Formal and informal play activities expand the children’s understanding of families, communities, and self. Free Play – Children learn social skills and expand their imagination through free play while thoroughly enjoying our wonderful outdoor play apparatus, sandbox, and toys as well as our many indoor activities.